Unless, of course, you really want to put her to sleep. Nevertheless, I want us to critique it here, since we’re a more select bunch. The paper is found here. Now clearly neither you nor I are likely to be familiar with the research methods of this particular field, nor of chasing up the papers from which both the data and methodology were gleaned. But even skim reading, and glancing at the titles of the papers sourced, shows that their method consists of multiple analyses of data that has already been multiply analysed by others, every analysis employed using models – lots of models. For example, their basic folklore database comes from a source that has already classified stories, presumably on the basis that similar stories found in different cultures are “really” the same story. Now granted that “Little Blue Riding Hood” probably has some literary dependence on the better known red variety, even that must be a subjective judgement, guided by both versions being easily available in our culture. In contrast the century of scholarly arguments over possible links between the Babylonian Enuma elish and Genesis (now pretty well resolved as non-dependence) show that such classifications are already based on an assumption that folk-tales evolve across societies, rather than (for example) containing repeatedly-generated themes adapted from patterns found in real life. The principal methodology used in this paper (apparently in a novel way) is itself an analogy – the study is primarily phylogenetic, taking the tools, and even the formulae, of biological palaeo-genetics to be applicable to human folklore. 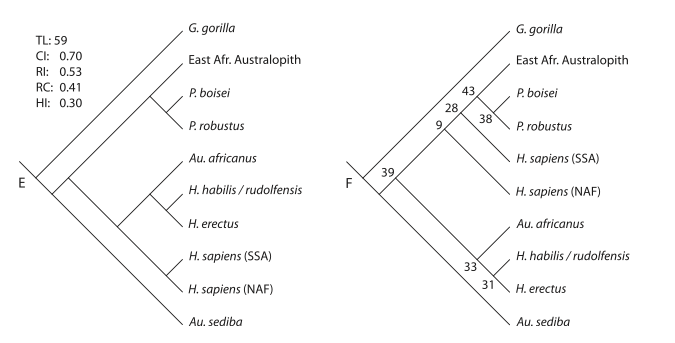 There are even obvious cladograms illustrated. If you are at all familiar with biology, you’ll know that even in that field the profound divergences between genetic and morphological trees is problematic – but the folklorists simply assume that the genetic model is true for biology, and that it will therefore be equally true for fairy-tales. Cladograms, for example, as has not infrequently pointed out, are not evidence for nested heirarchies, but rather a sophisticated way of arranging any set of data about shared characteristics into the best fit under the assumption of nested heirarchies. They work on the premise that similarities matter, but differences don’t (as I explored here). In any case, cladograms can vary widely according to the initial assumptions and the traits chosen. One of the objections made to any such biological classification is that if horizontal transfer of traits occurs to any significant degree, rather than only by common descent, ones tree will be completely invalid. But you’ll see in the folklore article that horizontal transfer (presumably a term also borrrowed from biology) is one of their working assumptions. It leads them to the employment of a few more models to distinguish one from the other. They use the Hittites as a control group, despite (because of?) there being no known Hittite folk stories. They refer to the hypothetical ancestor of Indo-European language groups (whether as a language or a people-group I’m uncertain). In fact they model the stories themselves on the basis that they ought to track language evolution. A while ago the excellent blogger The O’Floinn did a series on the profound, and often ignored, weaknesses of relying on modelling in science. The third part is essential reading in this context. Models abstract and simplify reality, which can be a valid way of approximating truth out of a complicated reality. But it doesn’t take much effort to realise that using a model to interpret a model, and another model to interpret that, and so on, does not tend to distill down to truth, but leads to seeing patterns within increasing noise. 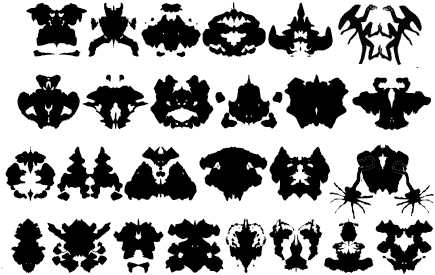 As often as not, the only patterns still visible are the assumptions you put in at the beginning.The method can only confirm the hypothesis for which it was designed. So my question is, should one read this paper, see its inordinate complexity and murmur, in profound awe of folklorist lore, “Respect!” Or should one instead refuse to be bludgeoned by unfamiliarity with the practices of a particular kind of science, and instead say, on principle, that the use of multiple models without any means of objective confirmation in the real world is pseudoscience? Maybe it doesn’t matter too much for the story of Wayland the Smith and his alleged transformation into Dr Faustus. But the same phenomena are all too common in more fundamental fields of study. Biology, the source of many of this paper’s metaphors, for a start. Population genetics is a modelling methodology. So is palaeogenetics. In terms of macroevolution, if they predict the actual findings of palaeontology, then the nodel has received some confirmation. But every time the two disagree, there is a problem. Your genetics may be more sophisticated, more technological, and based in clean labs rather than messy rocks. But it’s a model, and it isn’t being confirmed by your control, which is the fossils. 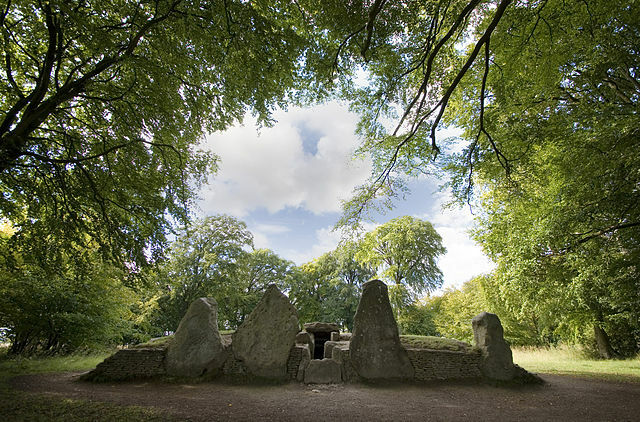 Wayland’s Smithy – the real one: proof positive of the story’s antiquity! Likewise in historico-critical biblical studies. The JEDP documentary hypothesis is still dominant (though no longer a “consensus” – in itself a weasel term meaning simply what is currently assumed by some sociologically-skewed professional group). But it’s a modelling methodology, based on a whole set of dubious, modern assumptions such as that any repetition in a text is a sign of two hidden sources, rather than a stylistic feature. Virtually no two authors have ever agreed fully when they have applied the tools to the texts – which is why the consensus has been dribbling away for several decades. Yet the conclusions of this model are used to model, in turn, the “real” history of Israel and its religion. Currently, it’s fashionable to place much of the OT’s composition into the post-Exilic Persian period – which also happens to be the period with the least historical knowledge that could act as a control. In other words, scholars have got used to constructing pretty well any story they like (subject to the constraint that it mustn’t be what the Bible actually claims). Just like the assurances of ancient origins for fairy-stories, really. But here’s the real challenge: if we refused to be persuaded by the conclusions drawn from the piling of models upon models, what modern sciences would survive? Those modern model-dependent sciences would survive whose models more and more accurately explain current reality and forecast future reality. Medicine, engineering, space travel come to mind. That actual healed body, that actual suspension bridge, that actual man on the moon, all confirm our faith in the science of the respective models. Evolution and other backward-looking fairy tale modeling do not. At least, not to my mind. Yeah – the checking against reality is the issue: which is probably why those fields in which that can be done tend not to push the modelling beyond one stage or so!